" 'Green News Report' - March 26, 2019	"
Cyclone Idai’s death toll has risen above 750 in the three southern African countries hit 10 days ago by the storm, as workers restore electricity, water and try to prevent outbreak of cholera, authorities said Sunday. On Friday, a containment wall breached around the tank farm and sent foam and other volatile compounds into a drainage ditch that leads to the Houston Ship Channel. Parts of the facility also re-ignited, but those smaller fire were quickly extinguished. Extra rain will bring more farm runoff down the Mississippi, which will likely lead to more oxygen-starved areas in the Gulf of Mexico and likely make the summer dead zone larger than normal. The start of the cleanup was coupled with a realization that the recovery could take years, amid warnings that current infrastructure of dams and levees won't be adequate to protect from the increased frequency & severity of flooding from climate change. 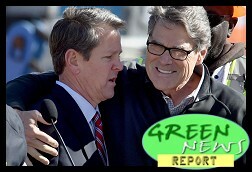 « PREVIOUS STORY "Barr Brawl: Trump AG's Summary of Mueller's Special Counsel Report Does Justice No Favors: 'BradCast' 3/25/2019"
"'Green News Report' - March 26, 2019"
A lot of this water comes from the ocean via heat induced evaporation. The seas are rising everywhere, and when they can't rise as much as ... well they go airborne and water rises ... from coast to coast (Countries With Sea Level Change - 3). The ocean is coming to a flood plain near you folks in Bob Dylan's country ("the country I come from is called the Mid-west" - With God on our side).